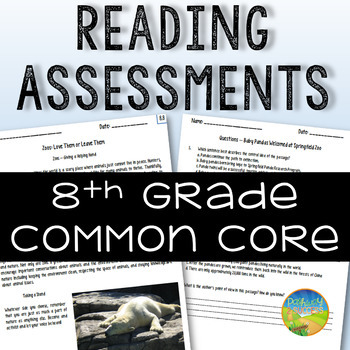 This is an 8th grade reading comprehension assessment package that includes two different common core aligned assessments for informational text (nonfiction). They can be used as a pre- and post-assessment at the beginning and end of the year. This would also be a great screening tool at the beginning of the year for all students. 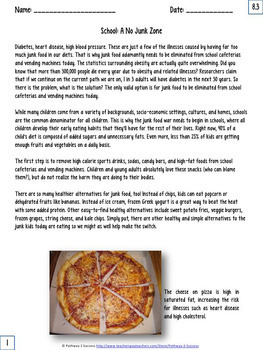 Each assessment includes two similar reading passages to align with Common Core Standards. 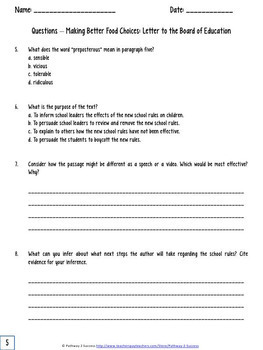 After reading the two passages, students will answer nine questions that are a blend of text-dependent open-ended response questions and multiple-choice questions. 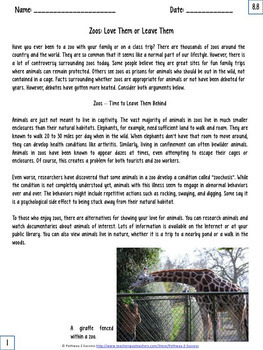 The first assessment topic is about zoos and the second assessment topic is junk food in schools. This assesses a student's ability to critically read and analyze challenging text. The reading levels of each passage are clearly listed at the top of each passage using the Flesch-Kincaid readability test. These tests are perfectly aligned to work with 8th graders but would also be a great back to school pre-assessment for incoming 9th graders or for higher 7th grade readers. Further, these assessments can be used for older students (grades 9, 10, 11, and 12) requiring specialized instruction or intervention services in the area of reading. Both tests include easy-to-read answer keys with sample model responses and a scoring key for written responses. To further assist with easy scoring, individual student scoring sheets and classroom scoring sheets for each assessment are included. These will allow you to review which areas your students need the most support in. There is no prep for the teacher! Teachers could also use results as part of their professional development goals and SLOs (Student Learning Objectives) by measuring growth from the pre-test to the post-test.